Use the iHomeServer Management Console to select either one, several or a whole folder of movie files. Click the 'AutoTag' button to automatically look up metadata from multiple internet providers. iHomeServer will select the best result and both tag your files and update iTunes with the resulting metadata and artwork. iHomeServer can either use any existing tags within the file or just the filename. Intelligent algorithms make decode most populate video file naming conventions. 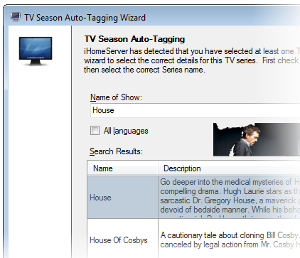 If you click 'AutoTag' on a series of files from a TV episode, simply select the show name, series number and starting episode number. 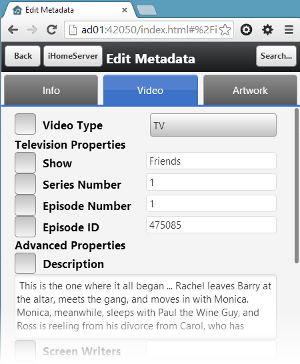 iHomeServer will then look up metadata for the TV series and tag the selected files with episode specific data. Of course there may be times when you need to manually set metadata on your media files. With iHomeServer, simply click the 'Get Info' button on either a single track or a set of tracks. 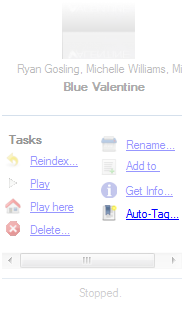 Just like in iTunes you can edit standard properties such as artwork, name, artist, album, programme and episode details. The iHomeServer Web Interface, new in version 3, extends the convenience of iHomeServer's AutoTag and manual metadata editing features to any web-enabled device. 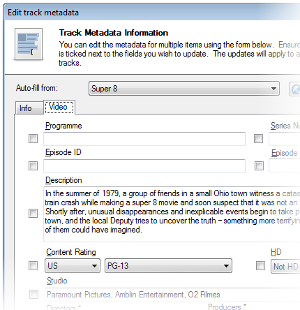 So you can fix up your metadata using your iPad from your armchair, or using Chrome on your laptop, or your Android phone ... the possibilities are endless! We have integrated with the top internet metadata providers to give you the best metadata. We use data from www.TheMovieDb.org, www.TheTvDb.com, tagChimp and xmldvd.info and search across providers to help tag even the most obscure titles. iHomeServer also lets you access your iTunes library from supported Web Browsers as well as from the Internet and from DLNA devices such as PlayStation 3 and XBOX 360 Consoles. It also helps rip DVDs into your iTunes library and much, much more! Download Your Free Trial Of iHomeServer for iTunes Today!